While tidying up some folders on the laptop I came across some old shots that had been hidden away. Images that haven’t been shown because they didn’t fit anywhere. Put away in folders like “Misc” and “temp” they are a time capsule to be opened only when I am bored enough to sort through them. Today is one of those days. So, the snow had finally (mostly) melted, not that we could tell as we drove over the Pennines to Sheffield. Surrounded by the pure white hills and clear lake water none of us could quite believe that spring had arrived and we were going to skate. 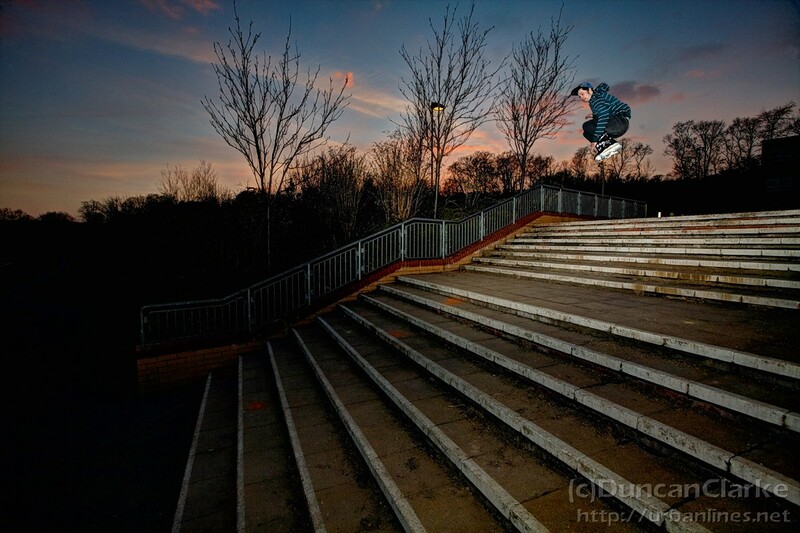 The Steel City itself however was relatively warm and sunny and rammed full of skate spots. After the first few warm up spots, I grabbed some decent shots but then as the sun went down we hit our last spot of the day. This is where Steve Swain decided to test out his new Kaltik Frames and flat setup on not only the kink rail, but this insane double set gap.